Costa Rica is a relatively small country, but it boasts one of the most diverse varieties of landscapes and climate in the world. It’s got the perfect harmony between the lush, green jungle teeming with wildlife and unadulterated beaches. Picture thick layers of jungle climbing up into the mountains, dotted with cascading waterfalls, flora every color of the rainbow, and home to exotic animals including toucans, parrots, monkeys, and sloths. At the jungle’s base, you step out onto a pristine, uninhabited beach with a picturesque coastline behind you, and postcard-perfect water in front of you. In reality, you’ll find each of these elements scattered throughout the country, but there are a few places where you’ll find beaches and the jungle. One of those gems, a place where you can have it all…is the country’s Southern Zone. In this area, the small city of Ojochal is a popular haven for expats, but there are two other nearby towns on expat radars: the beach towns of Uvita and Dominical. Uvita and Dominical are the perfect destinations if you are looking to get away from it all. Here there are opportunities to experience quiet beachside living and soak in all the nature Costa Rica has to offer. Dominical can best be described as a casual surf town. With a few restaurants and shops along the beach road and some local vendors selling souvenirs, there’s not a lot to distract from the relaxed lifestyle and world-class surf. But there is an expat community here, and the town is definitely ideal for those who enjoy their fair share of peace and quiet. For daily conveniences, Uvita has developed into a small commercial center, offering larger grocery stores, banks, and health services. Uvita, the whale-watching hub of Costa Rica, has broken the 1,000 mark in year-round residents, but provides a more off-the-beaten path experience than many other coastal towns. 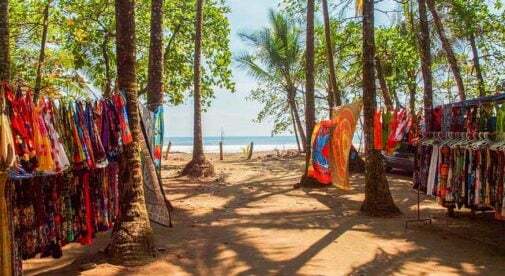 To remain within walking distance of the beach, it’s possible to rent in Dominical and Uvita for between $600 and $700 a month for a comfortable two- or three-bedroom house. If you’re willing to go a bit farther up into the mountains, which is a little cooler due to the elevation and the breeze you can catch as it rolls off the ocean, rentals are available for as little as $500 per month. The pride in protecting the natural landscape of this area makes it an appealing place for your own little piece of paradise. With regulations in place banning construction higher than three stories, and most of the coastline protected by Parque Nacional Marino Ballena, the large national park here, you have perfect tropical living, free from large housing developments, resorts, or high rises. For complete harmony between tropical jungle and salt and sand, Dominical and Uvita could be the picture-perfect place to truly slow down and soak it all in.